Why are the Elgin Marbles in London, and not on the Acropolis? Why do there seem to be as many mummies in French museums as there are in Egypt? Why are so many Etruscan masterworks in America? For the past two centuries, the most powerful nations of the West have been plundering the treasures of the ancient world to fill their great museums, without consequence. But in recent years, the governments of plundered nations have begun to push back, taking museums to court, prosecuting curators and threatening to shut down cultural exchange in order to force the return of these priceless objects. Where do these treasures belong? Sharon Waxman, a former culture reporter of The New York Times and longtime foreign correspondent, takes us inside this high-stakes conflict over who owns the treasures of antiquity, examining the implications for the preservation of the objects themselves and for how we understand our shared cultural heritage. Her journey takes readers to the countries where ancient civilizations originated, and to the great museums of the West to understand their response to this unprecedented challenge. This adventure story investigates four ongoing confrontations -- in Egypt, Turkey, Greece and Italy -- as they face down the Louvre, the Metropolitan Museum, the British Museum, and the J. Paul Getty Museum. A cast of determined and implacable characters engage in the battles that may strip these museums of some of their most cherished treasures. 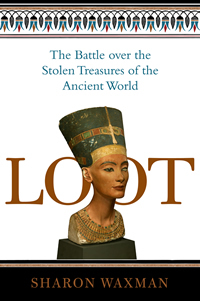 For readers who are fascinated by antiquity, who love to frequent museums, and who believe in the value of cultural exchange, Loot opens a window on an unpredictable battleground.